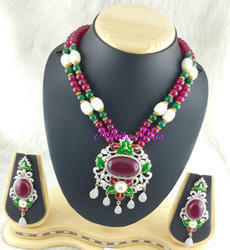 Description : Multifaceted imagination of our designers has beautified this Necklace made with multi-shaped beads. Fabric beads necklace sets. Fabric beads can be customised as per your requirement. - This necklace set is beautifully hand made with a chain style pattern & has bigger beads interwoven for a super chic look. - The multi chain earrings also a popular buy that can be paired with multiple outfits. - Uses brass metal scrap. 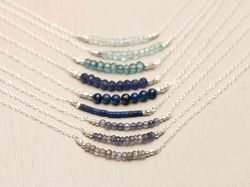 With our vast industry experience & in depth knowledge in this field, we are engaged in offering a quality-assured array of Beaded Necklace Set.